“‘Life is very long’ – T. S. Elliot,” says Beverly Weston (Fred Partridge) in the first scene. So is this play. In three acts, the three Weston sisters grapple with the disappearance of their father and the crazed actions of their mother Violet (Cindy Peterson), a headstrong matriarch who abuses prescription medication. At just over three hours, there is plenty of family drama to keep audiences interested and eager. The frequent profanity and yelling also doesn’t hurt. When they hear of their father’s disappearance, the three Weston sisters, Ivy (Katherine Morris), Barbara (Alaina Holland), and Karen (Samantha Silver), return home to be by their mother’s side. The house fills up with more and more family members as they try to figure out where Beverly has gone while each dealing with their own dilemmas. Ivy is in love with her cousin Little Charles (Cale Walde), Barbara’s husband cheated on her with one of his high school students, and Karen’s fiancé makes passes at her niece. 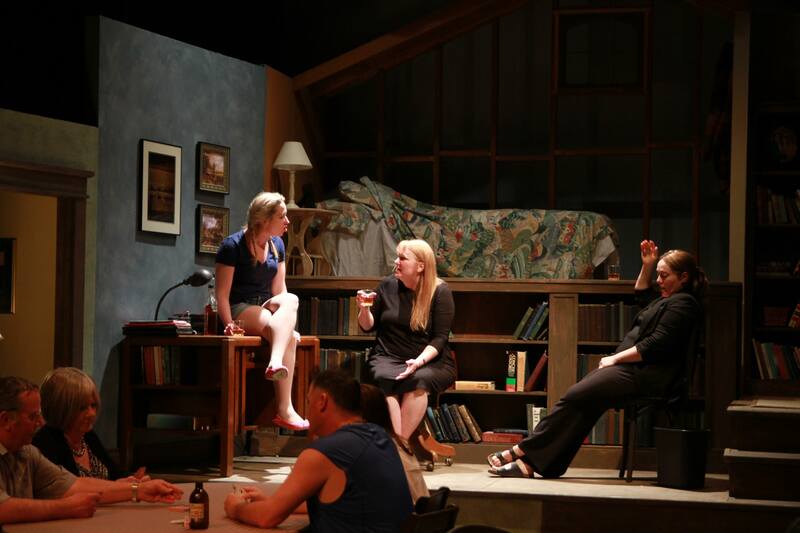 The detailed, multi-level set created the insular, dark mood of the Weston country home, while this large cast worked well together to bring this family to life. Peterson channels Meryl Streep’s performance in the film version to deliver the perfect blend of off kilter and domineering. Morris also stands out as the insecure Ivy. There’s nothing like a good dialogue-based drama, and this is a masterfully written script that goes to extremes yet feels authentic. The tension mounts until the dinner scene where Violet chastises everyone and Barbara wrestles her to the ground to take away her pills. Things get even more interesting when a family secret is revealed and entrusted to Barbara. Sharp dialogue, dark humour, and a dysfunctional family full of surprises: August: Osage County is what great drama is all about.